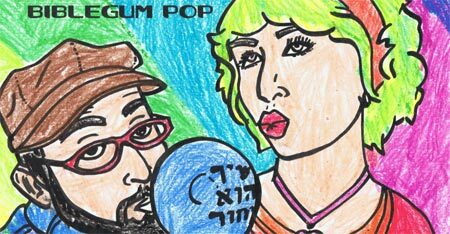 Dubbed “biblegum pop,” the band’s signature sound is the heretical combination of ancient, holy tongues with blasphemous backbeats and synthesized pop melodies. If Gwen Stefani and Will.i.am had been on the mountain with Moses, they would have come down sounding a lot like Stereo Sinai…The duo, made up of singer/songwriter Miriam Brosseau and producer Alan Jay Sufrin, was declared a “Favorite Band of 2009” on About.com. Artist development group Misery Loves Co. called them the “best new band in Chicago.” In fall of 2009, Stereo Sinai appeared on the Chicago indie music show “Errors Not Eliminated” and spoke on a Chicago Music Commission panel on musicians and social media… Stereo Sinai has been featured in a wide variety of recording projects since its inception in 2008. They contributed a track to the innovative “G-dcast” project, and, alongside artists such as David Broza and musicians from the Klezmatics, recorded a track to benefit cancer research with the New York-based “Pioneers for a Cure” initiative. Stereo Sinai represented Chicago at the International Jewish Music Festival in Amsterdam in 2008 and has been profiled by PresenTense magazine, Shemspeed.com, the Chicago Jewish News, and others. Stereo Sinai has contributed several holiday tracks to MyJewishLearning.com, and is featured on “Eats Paste,” a children’s compilation from ToyBlock Music. The duo recently moved to New York and is currently in the studio recording new biblegum pop for their upcoming release, “The Revelation Will Not Be Televised,” to be released in late fall of 2011. But that’s all just a bunch of noise. The proof is in the pudding, so you can listen to them below. I spent all day listening to them over and over again. Morally, I feel I have no choice but to buy these albums now. It’s like I was hypnotized by Brosseau’s ethereal voice and the combination of familiar traditional lyrics and contemporary, pop inflected musical arrangements. It’s really, really compelling! Can you tell I’m not a music reviewer? But I sure do know what I like. Anyhow, enjoy! Oh and it’s lead singer Miriam Brosseau’s birthday today, so… you know, happy birthday! 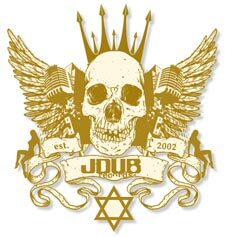 Heeb Redesigns Website; JDub Folds. Coincidence? Finally! After such a long wait in a land devoid of much GOOD Jewish music we in Washington state will be able to hear this soon! After months of listening to them on reverbnation or YouTube videos We’ll be able to listen to the new stuff upstairs as we get ready for Shabbat. (listening on my phone just doesn’t impress my kids as much). Thanks Stereo Sinai and happy birthday Miriam! I am so thrilled to see Stereo Sinai receiving the acclaim they deserve! It’s exciting to see people you genuinely LIKE doing so well. I can only wish them the best of luck and further success. Mazel tov, Miriam and Alan! Stereo Sinai totally rocks. Not only are they folks super-talented, they live by the values they sing about. Looking forward to the new material and to rocking with you! You just gotta give a listen, as my grandma would say – and hey, she would dig these tunes too! As will my 6th graders and my highschool students and my teen daughter – well you get the point. You’ll be hooked after your first song…or maybe the middle of one! Yeah, they’re THAT good! I used to wonder where the “good” stuff is. Sometimes people automatically assume you don’t like a certain genre because you say you don’t like what’s on the radio. Nope, pop music in itself isn’t evil, it’s just the emptiness that surrounds most pop music (and by that I mean the stuff on the radio most days). Stereo Sinai has brought pop music to a lovely level with ear drum thumping sounds, heartwarming and thoughtful lyrics and vocals to remind the listener people really can sing. I am anxiously awaiting the next TWO cd’s. My 4 year old is also very very excited. Promoting good music is challenging, but trust me, the kids, teens, middle aged and grandparents a like can all get into this.